What’s up with themed hotel rooms? Last year, we spent a week in a hotel on an island off of Croatia where all the rooms were decorated with colors inspired by the island’s local flora: grape, fig, agave, etc. 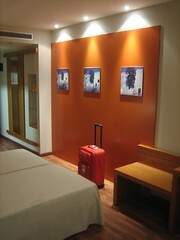 We stayed in a bright red pomegranate suite. I must confess that I’m a big fan of the themed hotel room. I remember a point in my life about ten years ago when I traveled a bit for work and felt like I was just shuffling from one Embassy Suites to the next. Not that there’s anything wrong with Embassy Suites, mind you. But it’s just so much more exciting to go to a hotel when there’s some sort of Karma associated with your room. It re-introduces some of the mystique surrounding hotels that you lose once you leave childhood. But I’m really looking forward to tomorrow’s trip. I can’t wait to see what “envy” looks like when you translate it into desks and bedspreads and lighting fixtures. If nothing else, it should serve to distract me from Finnish food. Reindeer carpaccio, anyone? Image: Hotel Room 27 by diebmx via Flickr under a Creative Commons License. Ok, just a bizarre coincidence, but I had a dream last night that I moved to Finland. Where did you go in Croatia? We were in Krk last year. Glad you are taking advantage of your enviable location. Brac. Off of Split. Totally loved it. Thanks for checking in! I love this blog. Totally addicted! Will miss reading until Monday. We went to Brac on our honeymoon. Apart from those sea urchins, completely agree. Green, obviously. And many shades thereof. Kind of like how I feel right now when I think about how I am not off to Finland tomorrow….. But then I think to myself: Lydia– Live, horse, and you will eat grass. And so the green of the grass I will eat replaces the green of the envy I feel. Hyvasti ja onnea to you and family!